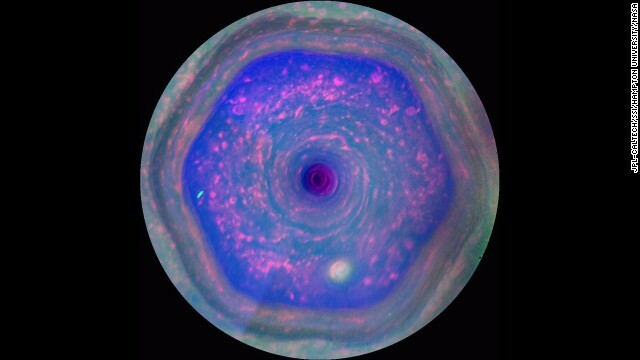 NASA’s new images of the “Hexagon” feature are the first to show a complete view of Saturn’s north pole. NASA’s Cassini spacecraft has provided your multicolored space distraction of the day: images of a swirling, six-sided weather feature on the surface of Saturn. Scientists say the “Hexagon,” the formation’s working title at NASA, is unlike anything they’ve seen elsewhere. They say the feature is “turbulent and unstable,” packing 200-mph winds. That’s nearly 50 mph stronger than the wind speed required for a Category 5 hurricane. “A hurricane on Earth typically lasts a week, but this has been here for decades — and who knows — maybe centuries,” said Andrew Ingersoll, a Cassini team member at the California Institute of Technology. The Cassini spacecraft was launched in 1997 and has been in orbit around Saturn, the sixth planet from the sun, since 2004. NASA hopes it will collect more pictures and other data of Saturn and its rings and moons through 2017. Cassini had photographed the hexagon before. But the short video clip released this week is the first high-resolution image of the massive jet stream, and the first with color filters. Cassini captured images of the hexagon over a 10-hour time period on December 10, 2012. The images, which scientists are still analyzing, are rendered in “false color,” a method that makes it easier to tell the difference between different parts of the storm. To human eyes, the hexagon and the planet’s north pole would appear in tones of gold and blue.